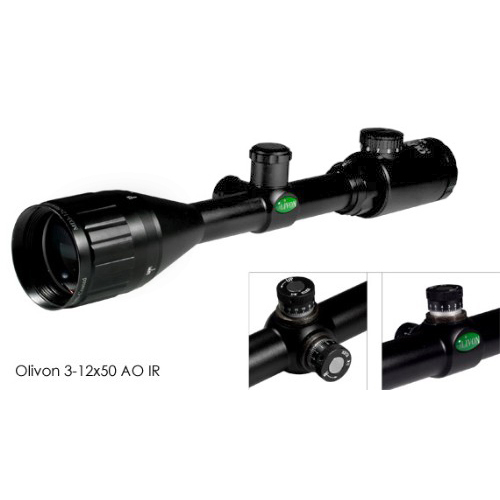 The Olivon Tracker Pro, 1inch Tube, 3-12x50mm Riflescope is an design and thoughtful innovations make it atremendous buy for the experienced shooter, as well as the novice that wants to get into varmint or target shooting or even long rangehunting. The objective and ocular lenses are multicoated to make your target look brighter and to give it more contrast. The coatings also help to reduce bright glare and reflections. The combination of its many shooting features alone makes it a best seller, not counting its clean appearance and the sharpness of its lenses. Completely fogproof, waterproof and shockproof. A 4" glare resistant sunshade and screw-in metal dust covers are included. Recoil Specs Not more than 1 moa @ 50 ft per lb.